THE MAJESTY OF CAVAILLE-COLL: Angela Kraft Cross Plays Franck, Tournemire, and Vierne. Notre-Dame-d'Auteuil, Paris; Cavaille-Coll/Gloton-Debierre organ (HI/71, 53 stops). European Organ Series, CA7124. Available from angelakraftcross.com. "The new recording of French masterpieces, played on the magnificent organ at Notre-Dame-d'Auteuil by Angela Kraft Cross, will delight listeners of all levels of experience. Dr. Kraft Cross presents Trois Chorals of Franck, two Improvisations of Tournemire, and three of the 24 Pieces de Fantaisie of Vierne, playing them with sparkling clarity, tasteful nuance, and intense lyricism, as well as great energy and passion. To single out a particular work for excellence would be a disservice to the remaining pieces on the program. From the poignant opening phrase of Franck's E-major Choral through the electrifying conclusion of Vierne's Carillon de Westminster, we are aware that a master musician is seated at the console. Dr. Kraft Cross, also a practicing ophthalmic surgeon, approaches this repertoire with a powerful intellect. She affords the seasoned listener a guided tour of the music, while giving those who are unfamiliar with the music a breathtaking and memorable first-time experience. Among the most important works of the late 19th century, the Trois Chorals (1890) of Cesar Franck stand out as improvisatory excursions for the organ. Franck was responsible for many musical innovations. He advanced tonality, chromaticism, and pure diatonicism, much as Saint-Saens did. He expanded single-movement, multi-section forms, fashioning them into unique, dramatic expressions even larger in scope than, for example, the Chopin Ballades or the Brahms Rhapsodies. Perhaps most significantly, he had changes made in the practice of organbuilding that allowed him to fulfill his symphonic compositional desires. Nearly twelve decades after their creation, Dr. Kraft Cross plays the Chorals as the fresh, groundbreaking pieces that they are. Her attention to detail generates a performance in which the overall architecture of the music, as well as the beauty of each moment, is readily apparent. She exercises considerable rhythmic flexibility, using what some might argue as too much rubato, yet she maintains the natural momentum of the music as if it is playing itself. We must thank Maurice Durufle for many things, among them his transcriptions-from recordings-of Charles Tournemire's improvisations. It is no wonder, given his unsurpassed genius, that Durufle was able to accomplish such a feat. Tournemire, a successor to Franck at Sainte-Clotilde, recorded five improvisations in 1930. Dr. Kraft Cross plays two of them on this recording, both of which are based on Gregorian chants: Ave maris stella and Victimae paschali. The Improvisations are characteristic of the stylistic evolution taking place during that period and could only have come into being during the musical culture of France at the time. Dr. Kraft Cross performs these gorgeous works with perfect technique, utter exuberance, and such clarity that they could be taken down as dictation by a musician with a keen ear, even upon first hearing. I had never heard either one before and am astounded by their beauty and splendor. Dr. Kraft Cross concludes with thrilling performances of Louis Vierne's Hymne du Soleil, Naiades, and Carillon de Westminster. Vierne wrote the four volumes of Pieces de fantaisie during 1926-27, while taking a break from composing full-scale symphonies. The Pieces de fantaisie are symphonically conceived, nonetheless. Among them are some of the most technically challenging pieces in the organ repertoire. Dr. Kraft Cross plays the perpetual motion of Naiades at an appropriately brisk tempo without so much as a tiny smudge. A more exciting performance would be hard to find. I have heard it said many times that anyone who can play Naiades can play anything. Angela Kraft Cross is a joyful musician and an exceptional organist whose virtuoso technique and deep understanding of style and architecture provide performances that everyone interested in the organ-and in the larger musical repertoire-should want to hear. Notre Dame-d'Auteuil is unquestionably the perfect setting for this program." "The title... is well chosen, but these are expensive souvenirs, not trite little bon bons! 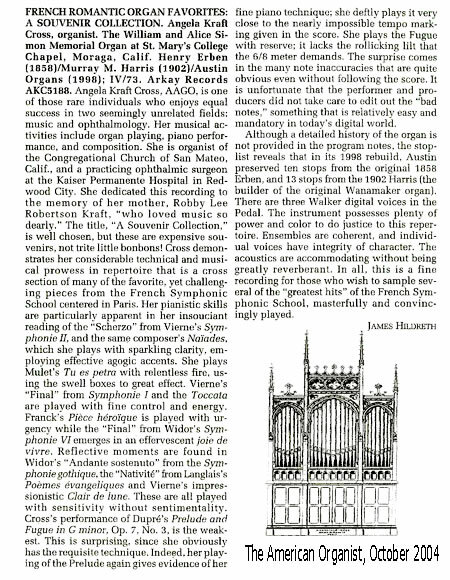 Cross demonstrates her considerable technical and musical prowess in repertoire that is a cross-section of many of the favorite, yet challenging pieces from the French Symphonic School centered in Paris... In all, this is a fine recording for those who wish to sample several of the 'greatest hits' of the French Symphonic School, masterfully and convincingly played." "Her program of music representing the stylus fantasticus, signifying compositions in a free improvisatory manner coupled with strict fugal writing, is presented with style, imagination, and vivid energy... Throughout, Dr. Kraft Cross plays with strength, assertion, musicality and technical assurance. Her invigorating spirited performances are marked by well-defined articulation and phrasing, rhythmic control, and a sensitive use of gesture... Her spell-binding performance of Bach's BWV 548 (the "Wedge") in particular demonstrates her dazzling virtuosity, especially in the scintillating passagework of the Fugue. In a word, her performances are 'fantastic'." "Dear Angela, Words cannot describe the thrill of hearing you play at Pony Tracks Ranch on Sunday! It was a memorable and exhilirating afternoon of music and it would be difficult to choose a "favorite" of all the pieces you played. Everyone there was delighted with your choice of repertoire and your performance and I just want to thank you for so graciously agreeing to be our guest organist. Thanks also to Robert and Peter your two accomplished helpers! I hope we get to hear you play again soon! With sincere thanks and best wishes,"